Would you pay 130 million baht for this car? 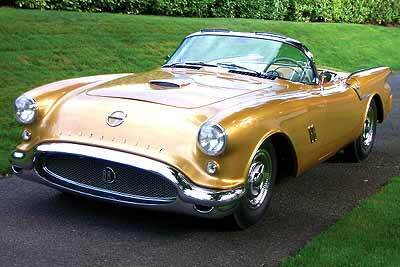 Well, I certainly would not, but somebody in America put down 3.24 million dollars to buy this 1954 Oldsmobile F88 Concept car! This news item was brought to my attention by regular reader John Gilding in America, who did not pay the 3.24 million either! This was the highest bid when the car was auctioned at the 34th annual Barrett-Jackson classic car auction in Scottsdale, Arizona. The $3.24 million was the highest price ever paid at that auction. The previous record, USD 2 million, was paid for a Hispano-Suiza J12 Binder, 15 years previously. The 3.2 mill car was initially known as the XP-20 project, but later more commonly became known as F-88 and was a pet project of GM styling engineer Harley Earl. Four cars came out of the project, but only styling order #2265 (this newly auctioned car) survived. It was sold in 1955 (or given) to E.L. Cord whose empire included at its height, Auburn-Cord-Duesenberg, Lycoming, the Limousine Body Company, Stimson Aircraft Corporation and some American airlines. Hundreds of internal GM documents and original blueprints went with the car. But 3.24 million? 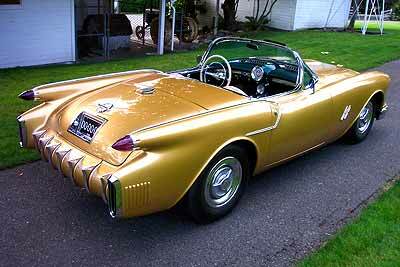 That last remark might be gilding the lily somewhat, especially since the Corvette line also came from the same design studio, but it is a 51 year old one-of-a-kind vehicle, I suppose. There were other cars that changed hands at the auction, including a 1934 Duesenberg Model J convertible coupe that sold for $2.75 million. Another high ticket item was the 1953 Ferrari 250 Mille Miglia Berlinetta sold for $1.43 million. From the UK came a 1962 Aston Martin DB4 GT Zagato that sold for $2.7 million, while for the US historians was a 1962 Lincoln Continental “Bubbletop” limousine used by President John F. Kennedy (presumably not the one he was shot in). According to R.M. Auctions it was used frequently by President Kennedy and First Lady Jacqueline Kennedy, and by President Lyndon Johnson, Pope Paul VI, and the Apollo astronauts. History was yours for the asking at around $600,000! Last week, I mentioned that folklore would have it that the first cars to be built in Australia were the Holdens in 1948, with the FJ now being an Australian icon. However, it was not the first car to be built Down-under. The first was built in 1898. I asked what was it called? It was called the Pioneer, built by the Australian Horseless Carriage Syndicate in Melbourne. It was of the ‘buggy without the horse’ type, with wooden wheels, a kerosene engine, chain drive and the usual ‘worm and tiller’ steering. So to this week. The red flag is used in motor racing to stop a race. However, the red flag also gave a name to a car released at the Leipzig Fair in 1960. What was this car? Clue: think chopsticks! With the start of the 2005 F1 season in two weeks at Albert Park in Melbourne Australia, the city is to celebrate the fact that this is the 10th anniversary (of when they ‘stole’ it from Adelaide) and will have a street parade of the F1 cars and the home-grown heroes, the Aussie V8 Supercars. The mayor of Melbourne is all enthusiastic and is modelling it on the very successful London street appearance of the F1 cars last year. He expects 200,000 people to watch the race cars going round Melbourne’s street corners. Now while this is on one hand a very good idea to promote motor racing, which I am all in favour of, what about all these new rules? Is the trip past Flinders Street Station part of the two race weekends rule for the F1 cars this year as far as engine life is concerned? If the car stops because it overheats at the slow speeds, does the driver go to the rear of the grid on Sunday? It will be interesting to see, because at least one, if not two of the multi-gazillion dollar Eff Wun cars won’t make it to the Melbourne City Hall, believe me. They may be fast, but only a certain manufacturer of red cars seemed to be able to make them last the distance in 2004. The other driver new to F1 is the second Jordan driver, Portugal’s Tiago Monteiro, who came second last year in the Nissan Dallara series. With neither having raced in F1, this is a very brave move by Jordan, which itself has been bought out by a group calling themselves Midland F1, owned by a Russian, Alex Schnaider. 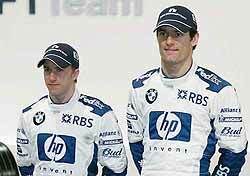 Midland F1 plan to use Russian testers, with Russian Roman Rusinov rushin’ off to be the first in line. Midland F1 also plan to build a new car for the 2006 season, at which time I believe they will drop the Jordan name. With all that, do not expect Jordan to be fighting anyone other than Minardi, and getting in everyone’s way! The other new driver is in a Minardi, so the bottom 10th of the grid has been reserved. This guy is Christijan Albers, a Dutchman, who has been in the DTM German Touring Car series for the past couple of years, coming third in 2004. This is a very competitive series, so Christijan is used to close racing. Putting the brakes on progress? Disc brakes are just an accepted part of today’s automobiles and have obviously been used ‘forever’. However, there are those who can remember back a little further and say that ‘forever’ began with Jaguar introducing disc brakes into competition during the 1952 Mille Miglia, but both these points of view are not quite correct. Since then, disc brakes are ‘de rigeur’ for all performance vehicles, and now they are used on about everything, other than the smallest, lightest and cheapest production automobiles. In recent years, production cars have gotten faster. The need for good brakes has become greater. To get over this need for better braking, the answer has been to increase the diameter of the disc brake. This has in turn brought about an increase in wheel size, to get the larger disc brake and its calliper inside the wheel rim. Ever wondered why production cars have gone from 15 inch to 16 inch, to 17 inch, to 18 inch and even larger? Now you know. ing problem. If one disc brake dissipates X amount of energy, do two disc brakes dissipate 2X? Simple mathematics would say yes, but life (and physics) is never that simple. Other variables come into play, so the end result is around 1.7X, according to those who are able to do the measurements. That is still almost twice as good as a single disc brake. One group that discovered this many years ago were the motorcycle engineers. Look at the front wheel of any half decent motorcycle and you will see twin disc brakes. And with the speeds these motorcycles can do, they are not there for looks. They are there for their stopping ability. Now come back to automobiles again, and start applying that technology. To get the same ability in retardation, you can go to smaller discs (when you use two of them), and then you can revert to smaller wheels and tyres, all cost saving, just for starters, with no loss of braking performance. It all seems so obvious, you wonder why has it not been used for cars? Well it has. Delphi Corp. has developed this technology that it believes will help solve many of the challenges currently faced by braking engineers. Based on a twin floating disc architecture with a single piston, the Advanced Disc System (ADS) provides a high specific torque capability, with substantial improvements in thermal management that can lead to benefits in weight, packaging and NVH (Noise Vibration and Harshness) refinement. The way this is done in the ADS is by using two discs floating on the outside diameter of the hub. A hydraulically actuated piston applies braking force via pads that operate on the outside and inside faces of each disc, providing four friction surfaces. The twin disc design also provides four cooling surfaces, without the need for vanes or cooling channels, substantially reducing thermal stress on the brake and hub-mounted components. Delphi’s testing indicates that in a typical high-performance SUV application, ADS could remove the need for several brake system specifications, reduce the maximum operating temperature by more than 100ฐC, improve NVH (refinement) and offer either reduced pedal travel by up to 25 mm (due to the reduced volume of fluid required for actuation) or booster downsizing by around 40 mm. Total vehicle weight saving could be as much as 7 kg, depending on system specification and the level of integration. Delphi says that ADS could be in production by 2006. Its technology will enable new automatic functions including electric park brake and hill-hold, improved pedal feel, help to simplify assembly and allow an enhanced interior layout and recycling benefits. These brakes will then be combining hydraulics and electronics. Dr. Fred Lanchester didn’t really know what he was starting. Or should I say - stopping! Who is where in 2005?